"ACC" is a medicinal preparation based on the acetylcysteine used for the treatment of respiratory diseases. The tool is produced in powder form. In one bag, "ACC" contains 100, 200, or 600 mg of active substance and auxiliary components: ascorbic acid, sucrose, saccharin and flavors (orange or lemon with honey). How to deal with the "smoker's cough"
Powder, "ACC" is used in the treatment of otitis media, acute and chronic sinusitis, and respiratory diseases, complicated by the formation of difficult to spit sputum: pneumonia, asthma, acute, chronic, obstructive bronchitis, bronchiectasis, cystic fibrosis and inflammation of the bronchial tubes. "ACC" must be taken after a meal, after dissolving the powder in a glass of hot water. In mucolytic therapy aimed at liquefaction, and facilitating excretion of sputum, the dose of "ACC" for adults and children over 14 years of age is 200 mg 2 or 3 times a day. Children from 6 to 14 years appoint 100 mg 3 times a day or 200 mg 2 times a day. Recommended instructions to "ACC" dose for children 2 to 5 years is 100 mg 2 or 3 times a day. In the treatment of cystic fibrosis children over 6 years appoint 200 mg 3 times a day. Children aged 2 to 5 years is recommended to give 100 mg "ACC" 4 times a day. If necessary, the daily dose of the drug may be increased to 800 mg, but only under the condition that the body weight of the patient is more than 30 lbs. During treatment is recommended to drink plenty of fluids (juice, tea, fruit drinks and fruit drinks) as this will greatly enhance the treatment effect "ACC". The duration of drug intake during a short-term flu is 5-7 days. In the treatment of chronic bronchitis, and cystic fibrosis, "ACC" take for a longer time to achieve a lasting preventive effect. With long-term diseases the duration of therapy is determined individually. Contraindications and side effects, "ACC"
Contraindications to the use of "ACC" are individual intolerance to components, pregnancy and breastfeeding, pulmonary hemorrhage and hemoptysis, as well as peptic ulcer occurring in the acute stage. 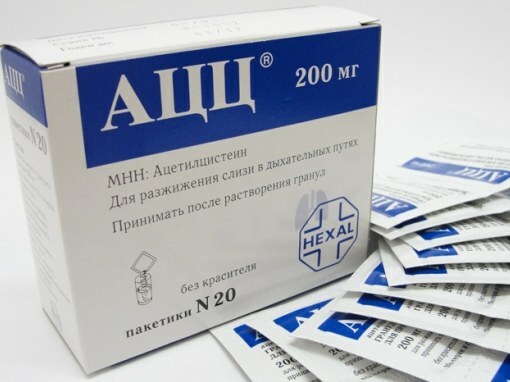 The drug with caution accept for varicose veins of the esophagus, asthma, high risk of development of pulmonary hemorrhage, renal and liver failure. Side effects, "ACC" can manifest as tinnitus, headache, and stomatitis. In very rare cases, nausea, vomiting, heartburn, diarrhea, tachycardia, and reduced blood pressure. In case of hypersensitivity to the drug can develop bleeding or an allergic reaction (hives, rash, itching, bronchospasm).